The fleshy part of the back of the leg is made up of several muscles. The most prominent is the gastrocnemius muscle, whose two heads form the bulky outline of the back of the calf. Gastrocnemius extends from just above the back of the knee down the calf until it merges with the Achilles tendon. 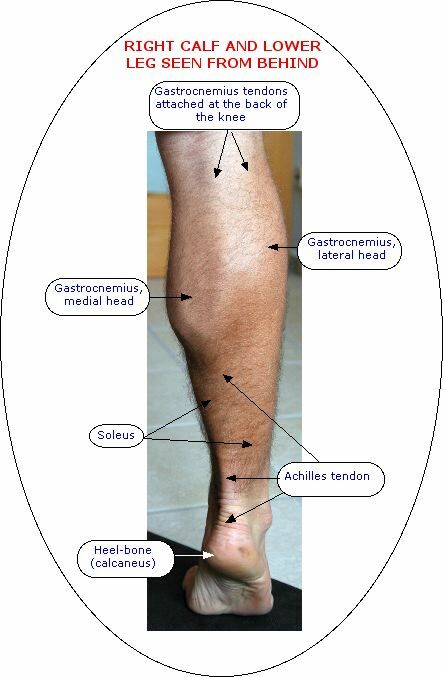 Underlying gastrocnemius is soleus, which is attached to the back of the shin-bone and outer leg-bone (fibula), and also merges with the Achilles tendon, which links both gastrocnemius and soleus to the back of the heel. 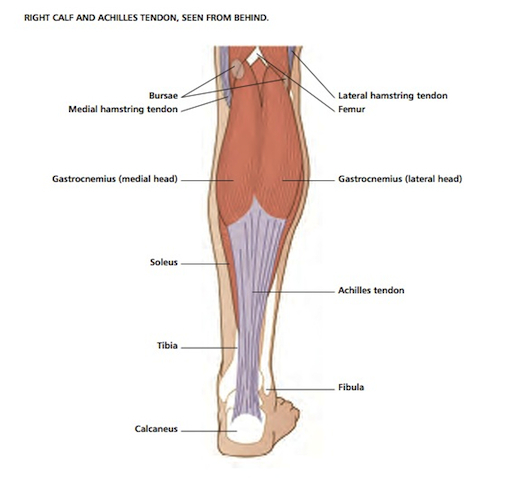 You can feel and see the soleus muscle on either side of the tendon in the lower part of the leg. There are more muscles under gastrocnemius and soleus. The plantaris muscle is very close to both: it’s a thin muscle which runs down the back of the calf between gastrocnemius and soleus, and links into the inner (medial) edge of the Achilles tendon. Several muscles lie underneath the upper layer formed by gastrocnemius, soleus and plantaris. One, popliteus, is attached to the thigh-bone at the back of the knee, extending down to the upper part of the back of the shin-bone. The others are the posterior tibial muscles, which act on the ankle and foot. The calf muscles and Achilles tendon on the back of the lower leg are active when we walk, run, jump and hop. When they contract and shorten they pull the heel up and bend the ankle so that the foot points downwards into plantarflexion. If you go up on your toes while standing up, the calf muscles shorten, working concentrically, to lift your body up against the force of gravity. As you lower your heel, the calf muscles pay out eccentrically to control the movement against the influence of gravity. Gastrocnemius also acts on the knee joint, helping the hamstrings to bend it. The gastrocnemius muscle is especially well developed in people who run fast or jump a lot, such as sprinters, footballers, hockey players and ballet dancers. The underlying soleus muscle is a slow-twitch postural muscle which plays an important part in balance, especially when you stand on one leg. The line of gravity falls slightly in front of the ankle when you stand still, so the soleus muscle is in a constant state of slight tension to hold the position. Soleus is also crucial to the movement of going up on your toes on one leg, while keeping your knee straight. If soleus is weak, especially following Achilles tendon injury, your knee tends to bend as you do the movement. The muscles beneath gastrocnemius and soleus, which extend downwards to act on the ankle and foot, enable the foot to turn inwards and outwards under the ankle and the toes to curl downwards into the ground. The lower leg muscles have an important role in helping the body’s circulatory flow. Unlike the arteries which deliver oxygenated blood round the body, the veins which transport the blood back from the foot towards the heart for re-oxygenation do not contain active muscles. The blood is pushed up through the veins as the leg muscles contract and relax. This system is known as the “muscle pump”. Valves in the veins prevent the blood from flowing in the wrong direction. If you sit still for long periods without activating the calf, your circulation slows down and yoru leg joints may get stiff, especially if you don't drink enough water. At altitude, the risk of blood clots forming in the lower leg veins is high, which is why you should always stand up and exercise during a long flight, as well as drinking plenty of water. The calf muscles, especially gastrocnemius, compensate if the hamstring muscles are weak. 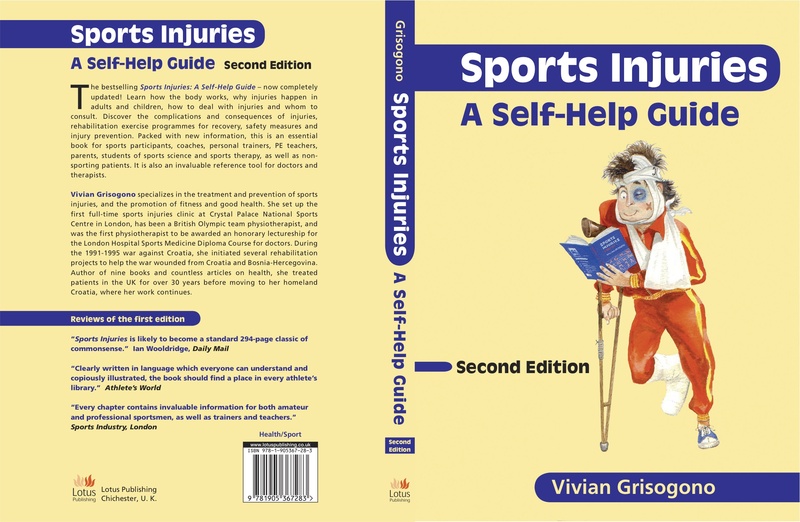 In injuries involving the upper layer of calf muscles and especially the Achilles tendon, the deep tibial muscles compensate: for instance, you may still be able to point your foot downwards slightly by using the toe-curling muscles, even if your Achilles tendon is totally ruptured. To strengthen the calf muscles, you need to press your foot down against a resistance, or lift your heel from the floor in the sitting or standing position, primarily with the knee straight, although you can also exercise the calf muscles with the knee bent.To stretch the calf muscles, your foot has to be bent beyond a right angle, so that your knee is in front of your ankle: your knee should be straight in order to stretch gastrocnemius, or bent to emphasize soleus and the underlying calf muscles which are attached below the knee. Because of their close association with the circulatory system, the lower leg muscles reflect any adverse changes in the blood flow. They are especially vulnerable to cramp, which is involuntary, often very painful contraction in the muscles, and which can happen during activity, rest or sleep. Relative dehydration is invariably a primary factor causing spontaneous calf muscle cramping, and it usually plays a part in calf muscle injuries or pains. Circulatory changes associated with the menstrual cycle or pregnancy can make females especially prone to calf muscle cramps and injuries. Tears and strains in the calf muscles can happen through over-exertion in sports, sudden changes of direction while running or hopping, or through over-stretching because of an awkward movement or fall.